Jewelry Buyers La Jolla: What Is My Jewelry Worth? Be wary of jewelry pieces that are vintage or antique “styled.” The seller may mislead you to believe the piece of jewelry is older than it really is: these pieces are usually just made in the styling of older piece of jewelry, but aren’t really that old. 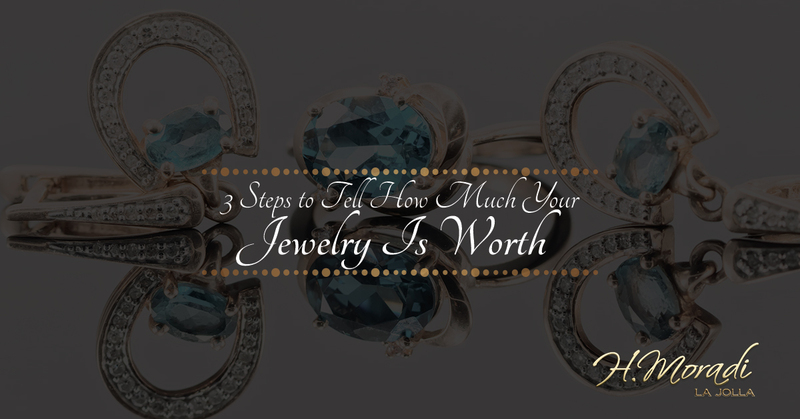 Knowing how the age of your jewelry affects its worth is important, but there are many ways to acquire the value of a certain piece of jewelry. One hallmark that is easy to find that will indicate the worth of your jewelry is the metal hallmark. Many pieces will have the type of metal printed on the metal. For example gold jewelry will have a marking such as 18K, 14K, 750, 585, and 375. Your jewelry may have a brand name hallmark which can help you ascertain it’s value. Brand hallmarks include Tiffany & Co., Cartier, Tacori, Sarah Coventry, AVON, & Trifari. A good rule of thumb is the heavier the piece of jewelry, the more valuable the piece is. This is always true for gold and silver items: they will always be heavier than less valuable pewter and brass gold-plated items. Also if you think a gold piece should be heavier than it is, it is most likely hollow. Additionally, if there are dark or silver spots on your jewelry then it is very likely that your piece is gold-plated. Fine jewelry will always have prongs. However, those costume pieces that have bright stones set with prongs can be worth a lot. Most costume jewelry’s adorning stones are glued into their settings. Are you ready to talk to our jewelry buyers in La Jolla? We would love to help you sell jewelry for cash or trade your piece in for something new that you will love. Visit H. Moradi Jewelers’ website to learn more about working with our jewelry buyers!